THE STORY - Rachel Chu is happy to accompany her longtime boyfriend, Nick, to his best friend's wedding in Singapore. She's also surprised to learn that Nick's family is extremely wealthy and he's considered one of the country's most eligible bachelors. Thrust into the spotlight, Rachel must now contend with jealous socialites, quirky relatives and something far, far worse -- Nick's disapproving mother. 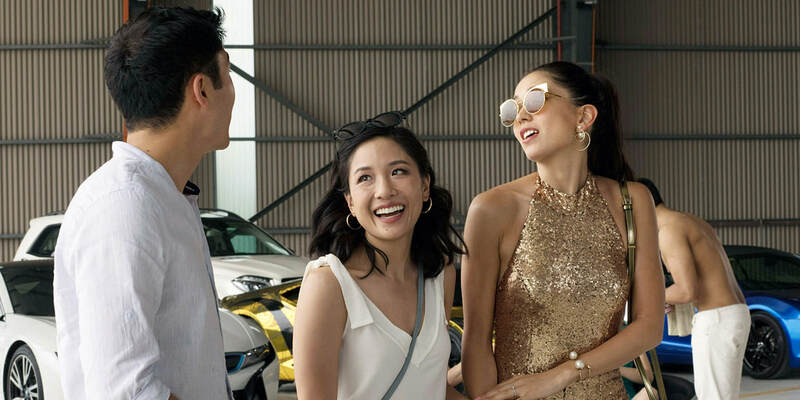 THE GOOD - Glittery, romantic, fun, and unabashedly steeped in Chinese culture, “Crazy Rich” Asians” gives audiences a much-needed update on the rags-to-riches rom-com with an across the board delightful cast. THE BAD - The secondary plotlines of some intriguing supporting characters are cut short or left undeveloped, making the film feel rather one-track minded. ​​In the opening scene of “Crazy Rich Asians,” a stunning Michelle Yeoh steps into the lobby of a luxe hotel, in a long dramatic, fur-lined jacket, presumably twenty, thirty years ago, in a time where racist hotel managers could easily reject prospective Asian guests -- which is exactly what happens. A bug-eyed supervisor wryly insists there are no rooms available for Mrs. Young and her family, to which she responds by making a call to her powerful, but wholly absent husband, the spectral Mr. Young. Upon her return, the owner of the hotel emerges from his chambers to greet Mrs. Young, brimming with warmth and respect. Take their bags! Set up the luxury suite! Meet the new owners of this establishment, he informs his employees. Mrs. Young is unfazed. Fast-forward to present-day New York City, where we meet NYU econ professor, Rachel Chu (Constance Wu), who lives a humble, middle-class existence teaching game theory to undergrads and hanging out with her spunky Chinese immigrant turned real estate agent mother, Kerry (Kheng Hua Tan), and her dreamy historian boyfriend, Nick (Henry Golding). Rachel and Nick have been dating for over a year, so when Nick is beckoned back to Singapore for his best friend’s wedding, he figures it's the perfect time to finally introduce Rachel to his extended family. But there are some major details he’s been keeping from Rachel, who arrives at the airport with tupperware noodles only to be escorted by some fancy-as-hell flight attendants to an ultra-sleek first class lounge with an engine and wings. It’s not hard to imagine how the extravagant displays of wealth and luxury in “Crazy Rich Asians” escalates from here. It’s been a while since the Meg Ryan golden age of rom-coms like “When Harry Met Sally” or “Sleepless In Seattle,” and while some relatively more recent movies remain fan favorites (“How To Lose A Guy In Ten Days”), there is something unavoidably superficial about the genre in its mainstream form since then. Gimmicky (“Failure To Launch”), pandering (“Valentine’s Day”), and overly reliant on absurd caricatures (“Monster-In-Law”), it would seem that the rom-com has been relegated to the ranks of a lesser genre. “Crazy Rich Asians” doesn’t necessarily break off from this tradition, so much as it breathes life into it with new identities and new conflicts rooted in culture and class differences that are specific to a particular experience, not ripped out of some generic bourgeois dream. Not to say “Crazy Rich Asians” isn’t ridiculous -- Nick’s cousin, Astrid (Gemma Chan) casually drops millions on a pair of earrings. The bride’s bachelorette party is on a remote island and includes an all-expenses-paid shopping spree and spa session. The Young’s estate is so exclusive, the GPS can’t track it down. But then this doesn’t insult the intelligence so much as it ups the stakes for Rachel and sets the stage for a fantastic, fairytale-esque denouement. Leading lady Constance Wu’s silver screen debut is a success, nailing her doe-eyed Asian Cinderella role while retaining elements of the wisecracking attitude she’s known for on “Fresh Off The Boat.” Wu’s chemistry with Michelle Yeoh’s Mrs. Young is captivating -- every single one of their scenes together was wrought with the distinct tension of interacting with (Or in some cases, confronting) the intimidating parents of your significant other. And Director John Chu doesn’t need to make Yeoh’s character a basketcase (Again, “Monster-In-Law”) in order to convey Mrs. Young’s disapproval -- instead, Yeoh plays Young with a composed fiery-ness, which must come naturally to someone like Yeoh. Goh Peik Lin (Awkwafina), Rachel’s here-for-the-ride-and-loving-it friend from college whose (Also wealthy) family lives in Singapore, stands out amongst the supporting cast as the funniest person on screen. With her smart quips and socialite-savvy advice, Lin articulates the clash between the Young’s old-money Chinese expectations and the Chinese-American immigrant reality of Rachel with great comedic effect. The rest of the cast is aptly used for the most part -- Golding is a veritable prince charming, and Jeong (Who plays Mun, Lin’s father) gets an entire scene to himself as the outrageous and unfiltered head of the dinner table, where the conversation veers into the inferiority of Americans. Only Gemma Chan’s ridiculously chic and poised Astrid is sorely under-used when her storyline about dealing with the discovery of her husband’s affair is short-shrifted, despite its potential to complement the primary Rachel/Harry narrative. I was admittedly a bit worried about “Crazy Rich Asians,” not so much doubtful of the talented Asian and Asian-American cast and crew, so much as fearful of what a major studio would do to make marketable Kevin Kwan’s titular book about love, family, tradition, and class. Of course, there were some diluted aspects (Rachel’s immigrant story and her relationship with her mother for example) that could’ve very well taken the front seat had the script made room, as well as the addition of some staple rom-com tropes (i.e. A dramatic airport proposal ala “Love, Actually” or “Garden State”). But these simplifications never took away from what is at its core, an unabashedly Chinese and Chinese-American story, with writing keen to the inside jokes and emotional experiences of every-day Asian-Americans (Airplane tupperware, ‘bananas’ or ‘yellow on the outside, white on the inside,’ the cultural crisis of Asian masculinity, etc. ), lovely transition sequences that pay homage to the importance of food in Asian culture and a Brian Tyler score that features some Hong-Kong pop classics as well as some American hits remixed with Chinese flair. Twenty-five years after the last mainstream Hollywood movie with an all-Asian cast (“Joy Luck Club”), “Crazy Rich Asians” begs the question why in 2018, it represents the first of its kind in Hollywood. Grumbling aside, I’m thrilled the day has come -- for the Asian-American community and for so many other immigrant groups whose breakthrough on the big screen should be only a matter of time.